I spend long periods in the summer in Greece, walking in the mountains. Preparations for the day typically consists of donning a pair of walking sandals (hence my avatar), lightweight shorts and a relatively fresh T-shirt. Dehydration is the main danger so I pack 1½ litres of water and a couple of bananas and a nutbar in my camera rucksack. That’s it. I go. Walking in July and August is the most arduous, what the ancient Greeks dubbed ‘Dog Days’, a term taken up by the Romans. They are the most oppressively hot, enervating days of the year, usually equated with evil and bad karma. Preparations could not be much different either. Upper body: two thermal long sleeved base layers; thermal mid layer; fleece lined ski jacket. Lower body: thermal long-johns; insulated ski trousers. Feet: silk undersocks; ski socks; thickly insulated ski boots (closely modelled on Medieval instruments of torture). Hands: mid-layer top looped over thumbs to cover wrists; fleece under-gloves; NEW ceramic-insulated mitts; disposable 8-hour handwarmers. Head and neck: neck tube; mid-layer top zipped up to the chin; balaclava; neoprene face-mask; NEW padded helmet with vents closed; goggles. That’s enough to keep me from becoming unbearably cold for up to an hour. Then, along with most others, I go into the ski lodge to warm up. Hands suffer the most. Feet have started to suffer in the last few days. How on earth did Shackleton cope in the Antarctic ?????????????? It’s worth it just to be up there in the high mountains. The air shimmers as every molecule of moisture freezes into billions of tiny ice particles, each a prism, on cloudless days refracting the sun into a sundog. 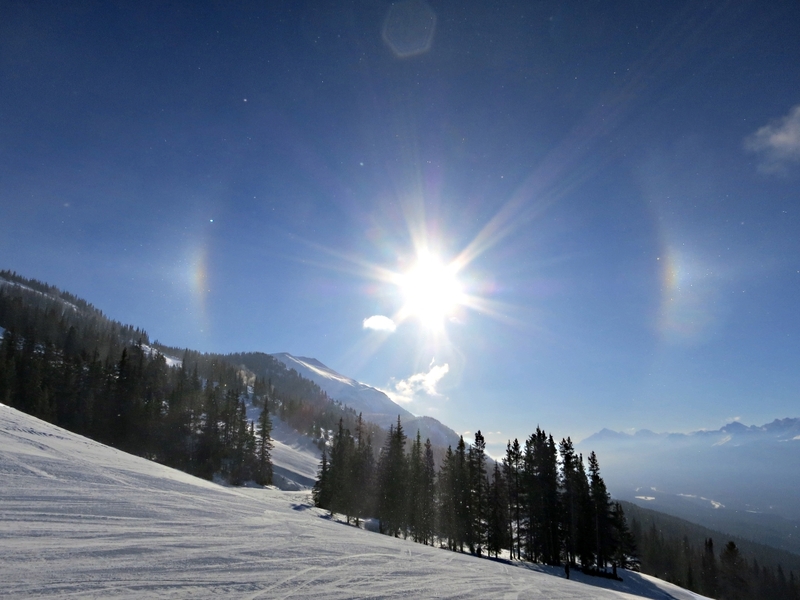 Sundog days are well worth the preparation and discomfort. 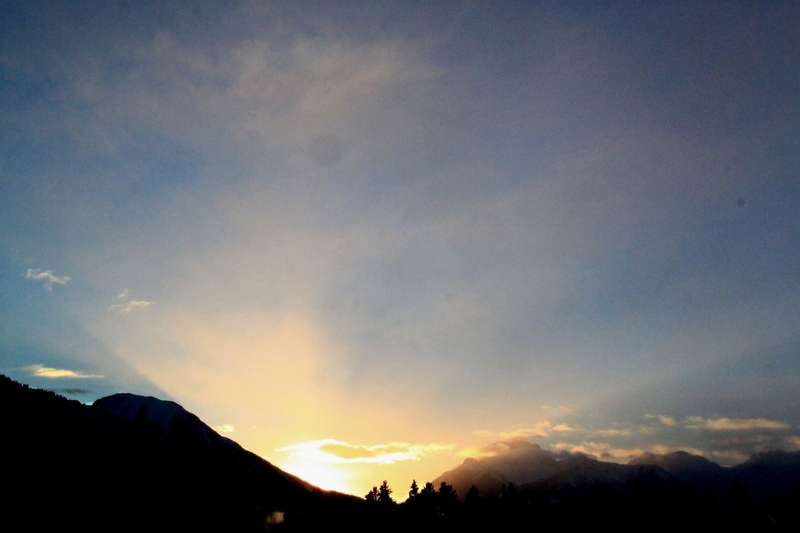 And at the end of the day, satisfaction and seeing the setting sun light up the sky beyond the mountains. 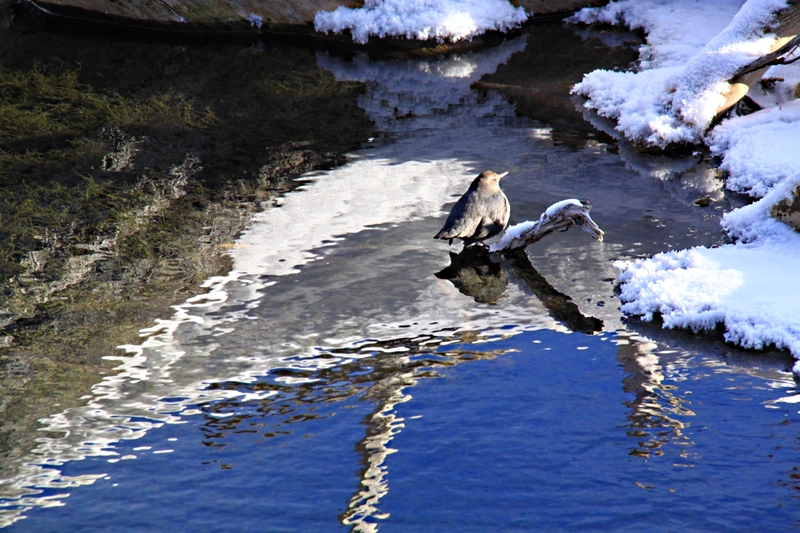 This entry was posted in Canada, Landscape, Mountains, Nature, Wildlife, Winter and tagged American Dipper, banff canada, Dog Days, freezing temperatures, Greece, ski wear, Sundog, trekking, walks. Bookmark the permalink.